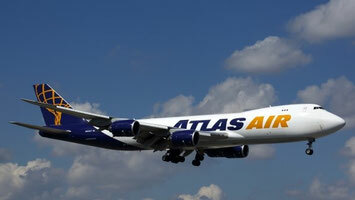 Atlas Air Worldwide (AAW) which also includes Southern Air and Polar Air Cargo, continues to report strong business results through Q2 of this year. The increase in revenues has seen a 71% year-over-year rise in adjusted net income by the end of the second quarter. The airline holding has also adjusted its profit forecast upwards for the whole year. AAW profits for the second quarter were US$49.7 million compared to US$29.1 million in the same period last year. Revenues generated in Q2 amounted to US$666.1 million, an increase of 29%. Total block hours flown were registered as 72,660, an almost 20% increase on Q2 last year. Because of the good first half year results and the expected continued strong demand in the second half of 2018, Atlas has adjusted its full year net profit upwards to between 45% - 50% above that of last year. AAW will operate a total of twenty B767 freighters for Amazon, of which 15 have already been delivered and are operated by Atlas Air. A direct cargo train link will connect Zhengzhou with a rail terminal at Bierset, adjacent to Belgium’s Liege Airport. The terminal is run by Liege Container Terminal (LCT), a logistics operator specializing in multimodal solutions rail/road/sea, in the latter case connecting the Port of Antwerp with the inland port of Liege. At the moment, LCT handles 7 daily trains to Northern Italy at its Bierset terminal. One of the main customers is logistics group Jost. LGG does not see the rail service as a threat or another competitor for its cargo business. According to LGG’s Cargo & Logistics Development Manager Bert Sells, this will strengthen Liege’s ambition as a European import hub for Chinese cargo, especially in the e-commerce sector. “We see this as a complementary service, enlarging our presence in this segment” - he stated. Earlier this month Alibaba’s dedicated logistics provider 4XP officially set up its Belgian subsidiary at Liege Airport. With the rail service LGG also sees opportunities to feed rail shipments into its 2nd line logistics park. Miami-based WCA Logistics Partnering has appointed Matthew West to the position of Managing Director of their Elite Global Logistics Network (EGLN). Mathew West has been with WCA for six years and has used his past sales experience to assist WCA’s members. EGLN merged with WCA in October of last year and claim that this move has given their members better access to more global partnering options. Mr West will work closely with EGLN’s President and founder, Roy Stapleton with the aim of providing what they term as un-matched member support to EGLN members. Four large Japanese Ussuri brown bears have moved from their domicile in Japan’s Hokkaido island to a new home in the United Kingdom’s Yorkshire Wildlife Park. The 9,000 km journey was arranged and handled by DHL Global Forwarding who took care of them on their long relocation adventure. Special temperature-controlled trucks chilled to 10 degrees Celsius were hired to bring them to Hokkaido’s New Chitose Airport for a short flight to Tokyo, where they were then transferred to a non-stop flight to London Heathrow. From there on it was a short truck journey to Yorkshire where the bears, which weigh up to 550 kilos each and are aged between 17 to 27 years, arrived in good health and since then are doing their best to adapt to their new English climate. 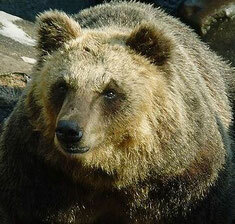 The Ussuri brown bear is listed as an endangered species in Asia. Changsha Huanghua Airport, China’s thirteenth largest and which is situated in Hunan Province, will now get a direct freighter service to the USA. A Chinese lobster company has signed a long charter agreement with Miami-based SkyLease Cargo for regular B747F flights between Changsa and Chicago O’Hare Airport. The operation, Changsa’s first B747F cargo operation, will include a fuel stop in Anchorage. 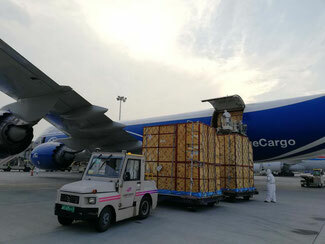 SkyLease Cargo which has six freighter aircraft on its books have earmarked a B747-400F which they have on lease from LCI Leasing for the flights. Presently only three of the six freighters are on active duty (1 B747F and 2 MD-11Fs), with the others presently in storage. Probably no danger that the U.S. administration will place increased tariffs on imported Chinese lobsters as so many of Washington’s elite enjoy them so much. The German Board of Airline Representatives (BARIG) has at its latest Air Cargo and Logistics sitting stressed the importance that digitalization will play in sustaining Germany’s performance as an air cargo location. There has been much discussion in German aviation circles during the past two years on the lack of progress on advancing present and introducing new digitalization procedures to enhance cargo handling operations. The Fair@Link process (CFG reported) which was initiated by LUG aircargo handling GmbH and Frankfurt operator Fraport AG was a first important step in this direction. However, Michael Hoppe, BARIG’s Secretary General made it clear that this must be a mutual initiative and that the next step must be more involvement by members with a rapid and targeted analysis as to which steps must now be taken to speed up the process. AirBridge Cargo Airlines (ABC) is no stranger to moving animals across the globe. The carrier has what it calls its own ‘abc CARE’ product whose team is dedicated to the handling and flying of live animals. Recently a dedicated CARE team took charge to transport 66 baby giraffes, with a total weight of 38 tonnes, from Johannesburg Airport to Zhengzhou, China. A B747 freighter was chartered for the operation and the giraffes which are three metres in height had to be loaded in specially designed crates for the long journey via ABC’s Moscow’s Sheremetyevo Airport hub. There were specially trained giraffe attendants on board to take care and feed them of which there were loaded three to a crate. All arrived in good health in Zhengzhou and have been distributed to various ani-mal parks in the region.